Love is contented with one’s self, is respectful, and is open to other’s perspective and change. Love honors others and uplifts for the benefit of all. Love is centered peace and calm, listens with an open heart, excuses another’s behavior, and sees wholeness. Love seeks goodness and the light and rejoices with the Truth. Love always protects, always trusts, always hopes, and always perseveres. This summer, I have truly had the honor of officiating wedding ceremonies for some very dear couples. I found that quite often, couples chose to incorporate the reading 1Corinthians 13:4-7. 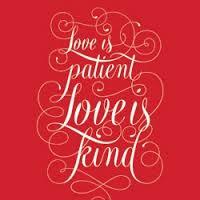 This reading is sometimes referred to as the “Love Is Patient” one or the “Love Reading”. For those couples who are not religious, the reading can be read in a secular fashion and reaches a wide audience. I have loved the love reading for years and I have rewritten the passage using affirmative language. Personally, I prefer the uplifting language to be inspirational. I hope that you enjoy it and please share with your loved ones.